Acute ear infections have increased worldwide in recent decades and are so common they are almost unremarkable now; they affect 80% of American children by age three and are the leading reason for child doctor visits, antibiotic use and the number one pediatric surgical procedure –insertion of plastic tubes in the ears. Childhood ear infections cost the healthcare system almost three billion dollars a year. As a possible mechanism for vaccine-induced ear infection, study authors Mawson and colleagues cite a 2006 study that looked at the types of bacteria in the nasal passages of children immunized with pneumococcal vaccine vs. “historical controls” – kids from the prePCV-7 era — and found an increased colonization of a bacteria called M. catarrhalis in the vaccinated group. M. catarrhalis, it turns out, is associated with an increased risk of ear infection. Broad-spectrum antibiotics like those frequently used for ear infections are like napalm on the microbiome — they may wipe out bugs that cause ear infections but they affect many other microbes as well, shifting microbiome composition in ways that science is only beginning to understand how profoundly this impacts health. New research links microbiome shifts to a growing list of diseases from irritable bowel syndrome, obesity, Crohn’s disease, diabetes and multiple sclerosis to mood disorders such as anxiety and depression, mental illnesses such as schizophrenia and autism. As with autism, public health authorities have no answers to explain the explosion of immune-mediated allergic disease. But researchers routinely create animal models of allergic disease by exposing them to aluminum adjuvants – the sort used in vaccines – at the same time as allergens. Recent experiments (here, here and here, for example) describe how scientists use aluminum to stimulate allergic rhinitis (hay fever) in mice. For more than a century it has been accepted public health dogma that vaccine benefits outweigh risks. 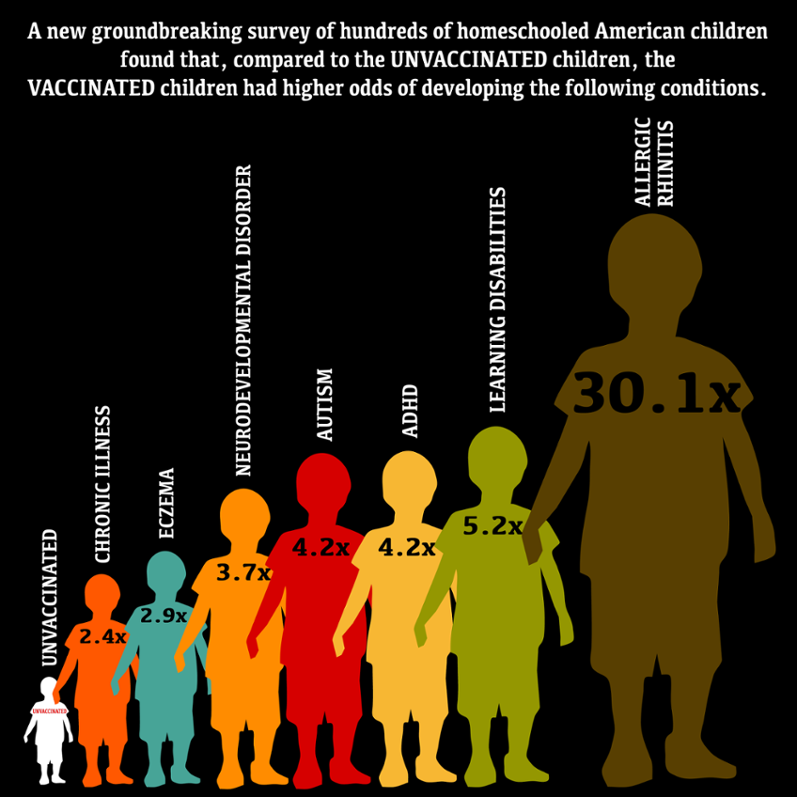 What’s more, with the introduction of five new vaccines since 1995, bringing the total inoculations to 35 by kindergarten age, studies of the combined effect of vaccines have never been done. The reality is: real vaccine benefits are theoretical and real vaccine risks are unknown. The emerging “vaccine war” is really just growing numbers of “hesitant” parents (and health practitioners) questioning the CDC vaccine schedule for good reasons: Why are doctors who profit from vaccines the spokesmen for public health? Can government health agencies really be trusted to protect our children when they are so wedded to the pharmaceutical industry? Why are toxins in vaccines? Does my kid really need this vaccine or is somebody selling it, like Coca-Cola and video games? Why is it acceptable to knowingly sacrifice some children for the greater good? Is that greater good real or is it a mirage?